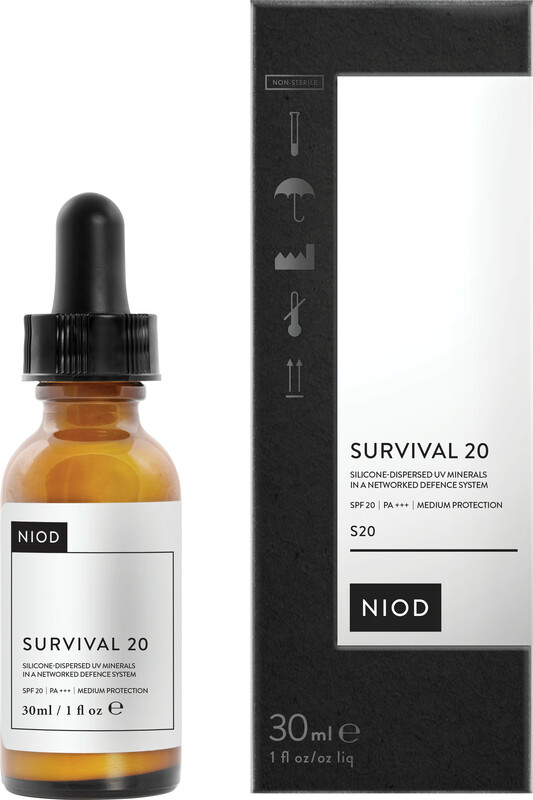 Protect your skin with the medium UV mineral shield of NIOD Survival 20, a lightweight formula that defends against UVA and UVB rays. NIOD Survival 20 works to keep your skin supported and healthy, no matter your lifestyle choices. Whilst protecting your skin against sun damage, pollution, stress and blue lights, this medium defence facial SPF inhibits premature ageing, keeping your skin radiant and youthful against the effects of photodamage. Packed full of antioxidants that restore vitality, purified lutein and dimethylmethoxy chromanol fight free radicals, whilst a tomato carotenoid complex soothes the redness associated with exposure to UV light. In addition, a prebiotic complex of gluco-oligosaccharides and inulin supports your skin’s friendly microorganisms without stimulating harmful ones. Apply to face prior to sun exposure. During prolonged UV exposure, reapply every 2 hours or after towel-drying, perspiring or swimming. From from alcohol, parabens, sulphates, mineral oil, nuts and gluten. Vegan. Cyclopentasiloxane, Aqua (Water), Zinc Oxide, Titanium Dioxide, Glycerin, PEG-10 Dimethicone, PEG-9 Polydimethylsiloxyethyl Dimethicone, Propanediol, Acrylates/Ethylhexyl Acrylate Crosspolymer, Dimethicone/PEG-10/15 Crosspolymer, Hexyl Laurate, Polyglyceryl-4 Isostearate, Dimethylmethoxy Chromanol, Inulin, Alpha-glucan oligosaccharide, Solanum Lycopersicum (Tomato) Fruit Extract, Superoxide Dismutase, Xanthophyll, Pinus Pinaster Bark Extract, Polygonum Aviculare Extract, Alteromonas Ferment Extract, Padina Pavonica Thallus Extract, Arginine, Glycine, Alanine, Serine, Valine, Proline, Threonine, Isoleucine, Histidine, Phenylalanine, Aspartic Acid, PCA, Sodium PCA, Sodium Lactate, Squalane, Simmondsia Chinensis (Jojoba) Seed Oil, Tocopherol, Melanin, Sucrose, Tapioca Starch, Stearic Acid, Trimethylsiloxysilicate, Pentylene Glycol, Butylene Glycol, Trisodium Ethylenediamine Disuccinate, Sodium Chloride, Dipropylene Glycol, Tromethamine, Ethoxydiglycol, Alumina, Potassium Sorbate, Sodium Benzoate, 1,2-Hexanediol, Ethylhexylglycerin, Phenoxyethanol, Caprylyl Glycol.